At the far left is 16-year-old Miyu, who is wearing a monochrome print outfit consisting of a black vintage vest over a striped sweatshirt, black baggy pants from Faith Tokyo, and Demonia platform boots. 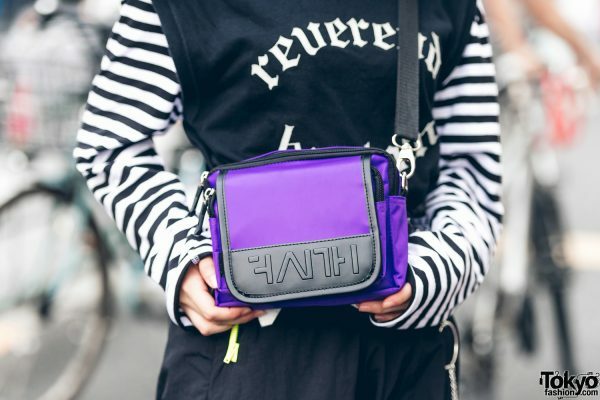 Her accessories – handmade and from Forever21 – include layered collar necklaces, layered black and white grommet belts, a wallet chain, and she is wearing a purple sling bag from Faith Tokyo. Miyu’s favorite brands are Faith Tokyo and Never Mind the XU. 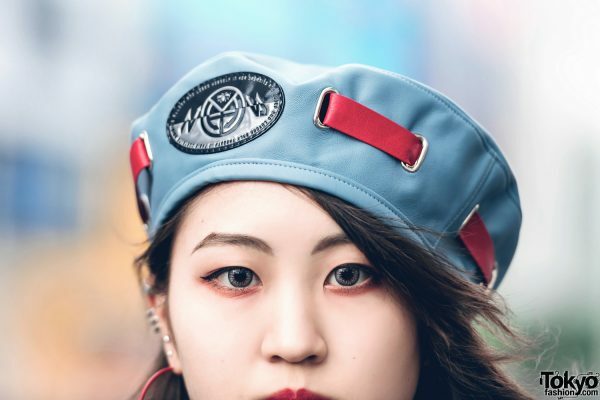 Follow Miyu on Instagram. 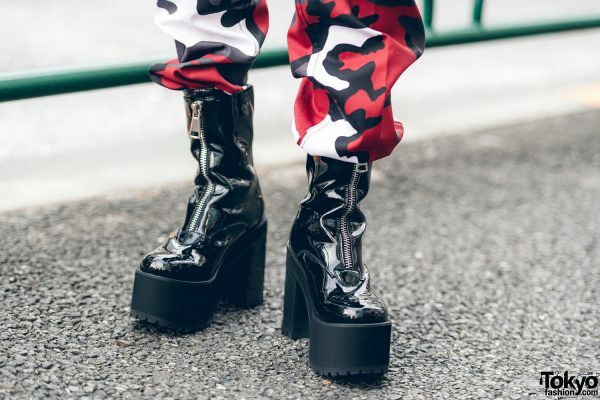 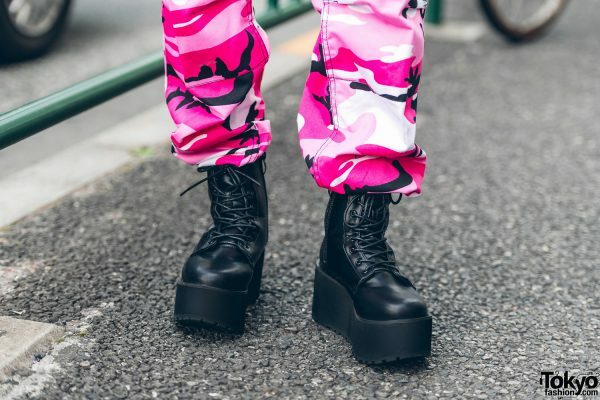 Next is Kunieda – 17-years-old – whose style features a leather jacket from Bubbles, an Eria/Area cropped lace up top over a fishnet turtleneck shirt, and red camouflage print pants from Rothco. She paired her outfit with Bubbles platform zipper boots and a black 99%IS- belt bag. 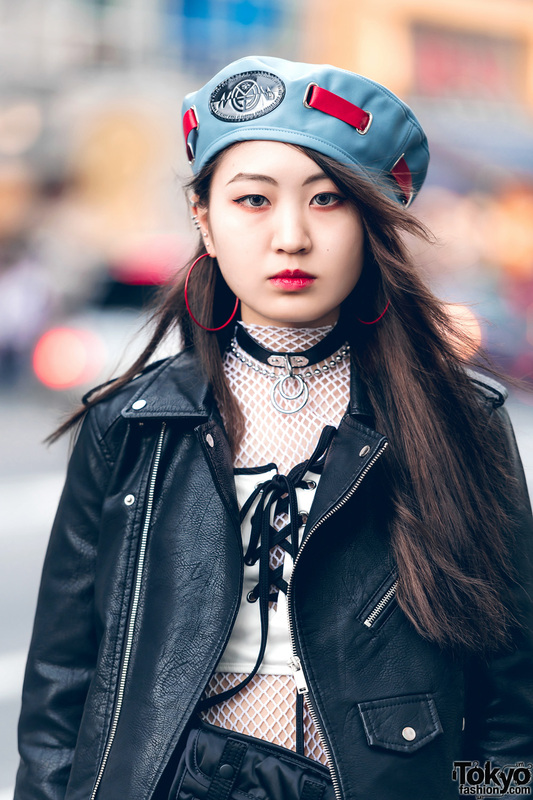 For her accessories (from Forever21 and vintage/resale pieces), Kaho wore a blue leather beret with red stitch details, silver ear cuffs, red hoop earrings, an o-ring choker and ball chain collar necklace, and a silver wallet chain. Her favorite labels are Faith Tokyo and M.Y.O.B NYC. 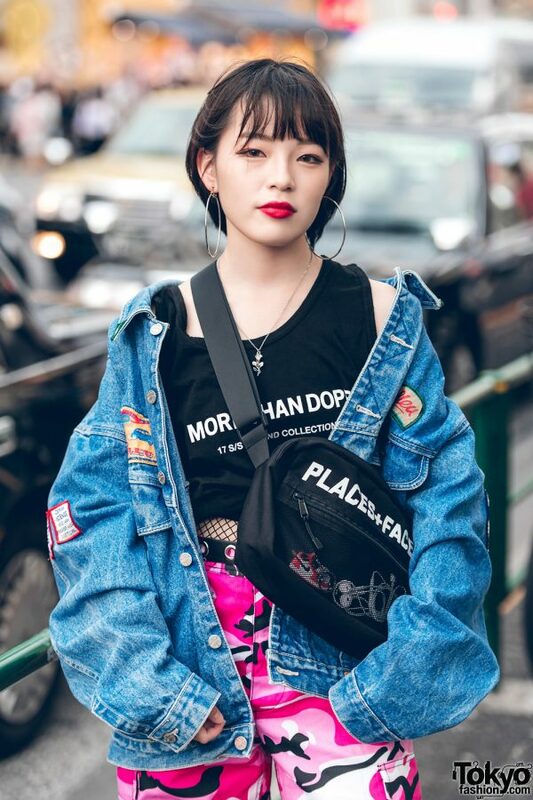 Kunieda is active on Instagram. 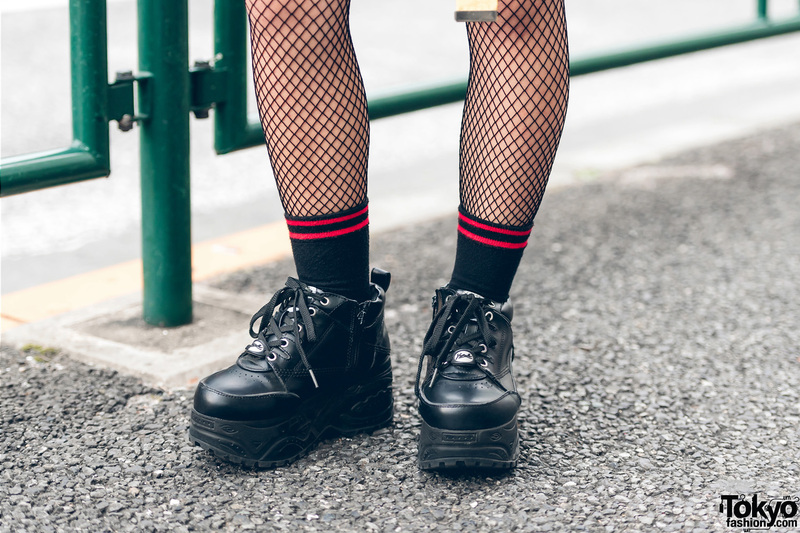 Sporting fishnet stockings and a braided hairstyle, 16-year-old Ema’s outfit features a Rebertas black jacket over a black vintage Rugrats t-shirt, a gold metallic belt, a pink vinyl skirt from Peco Club, black socks with red contrast trim, platform lace up shoes from Yosuke, and a white Oh Pearl sling bag with red straps. Ema’s favorite fashion brand/shop is Kinji Harajuku. For her social media updates, follow Ema on Instagram. 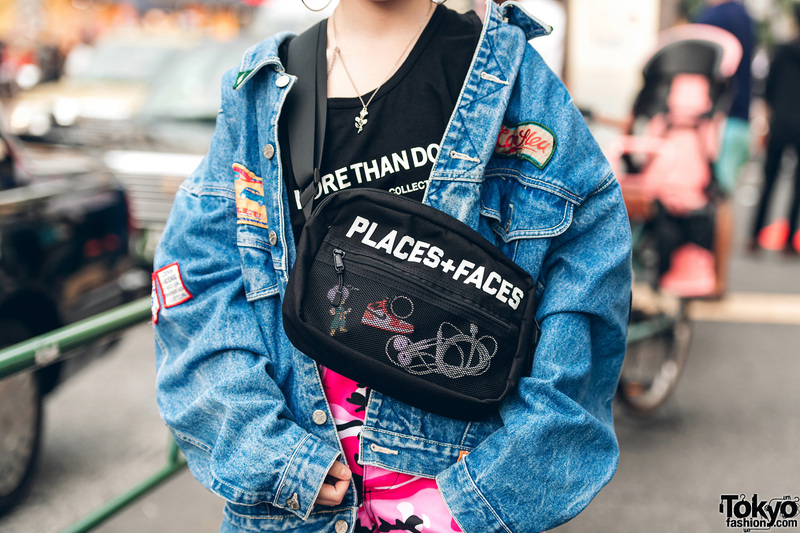 Wearing oversized hoop earrings, 17-year-old Mitsuki’s look features a vintage denim jacket with patches, which she wore over a More Than Dope cropped vest and fishnet top, pink camouflage print pants from Rothco, platform lace up boots from Skyroom, and a Places + Faces black sling bag with a front mesh zipper pocket. 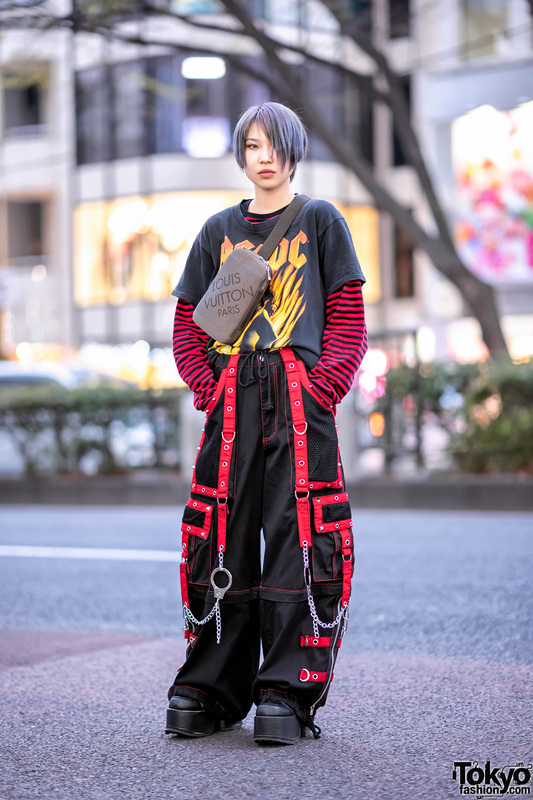 Her accessories – from Never Mind the XU and Faith Tokyo – include oversized silver hoop earrings, a silver flower pendant necklace, and a black grommet belt. 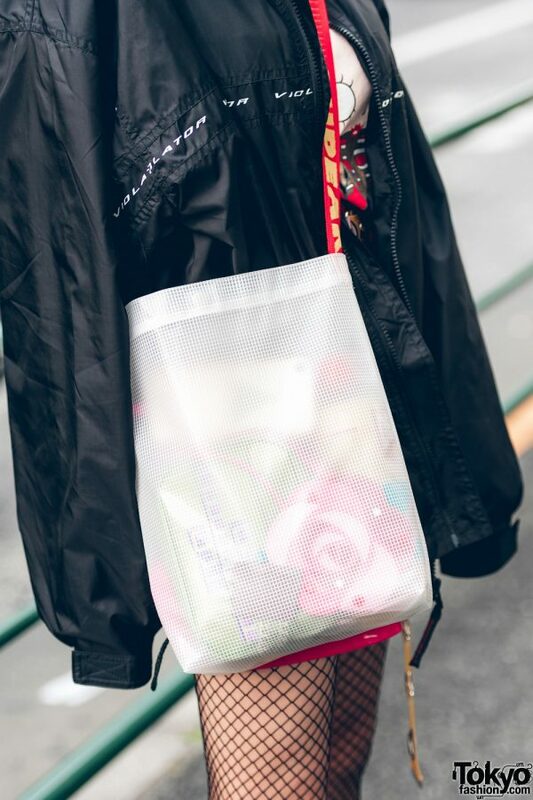 Mitsuki likes to shop at Places + Faces and Kappa, and she enjoys the music of Yurufuwa Gang. 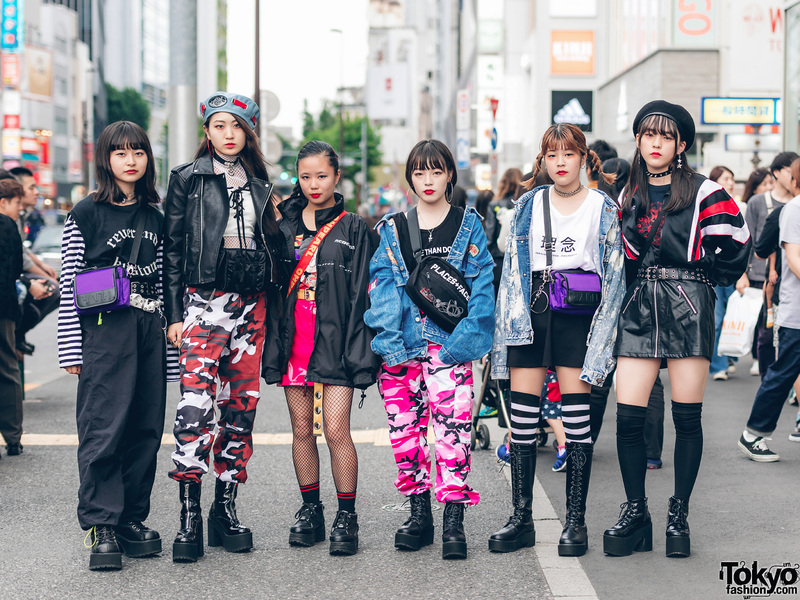 With braided twin tails, 14-year-old Megumi’s style consists of a vintage acid wash denim jacket over a white t-shirt, a black skirt, thigh high black and white striped socks, knee high lace up boots from Open The Door, and a purple sling bag from Faith Tokyo. 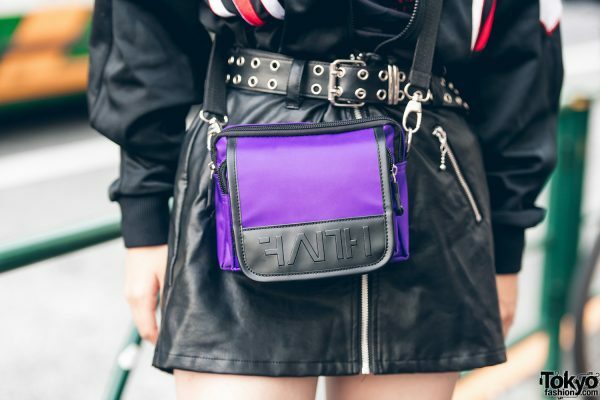 Her accessories – from Forever21 – include a double layer chain necklace, a black grommet belt, and a silver wallet chain. 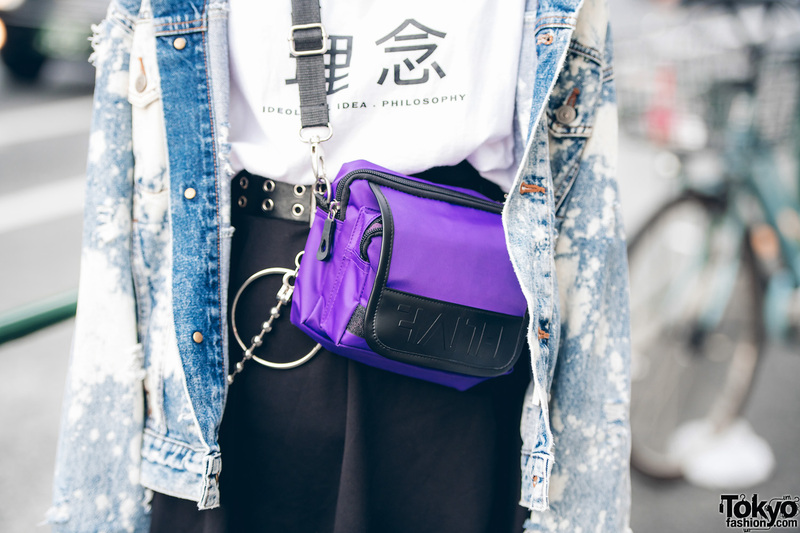 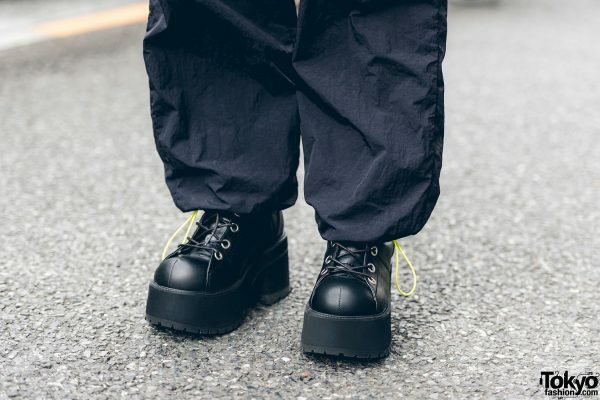 Faith Tokyo, Open The Door, and WEGo are Megumi’s favorite brands. 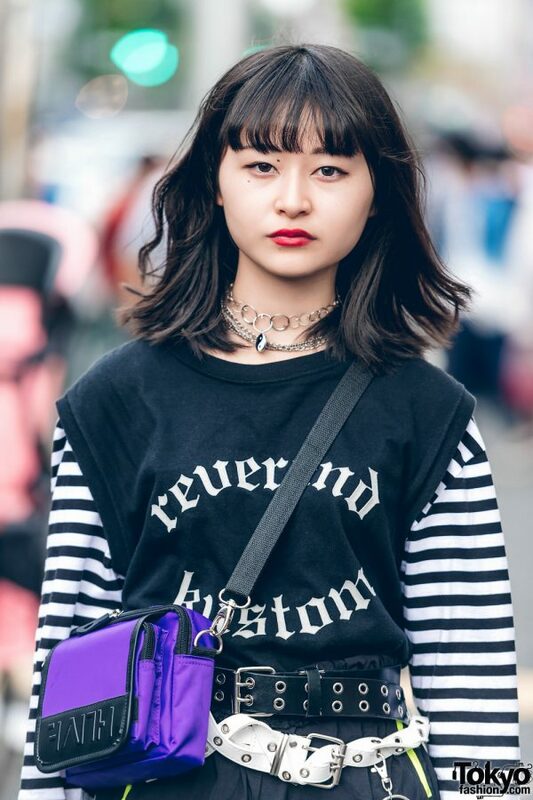 Check out Megumi on Instagram. 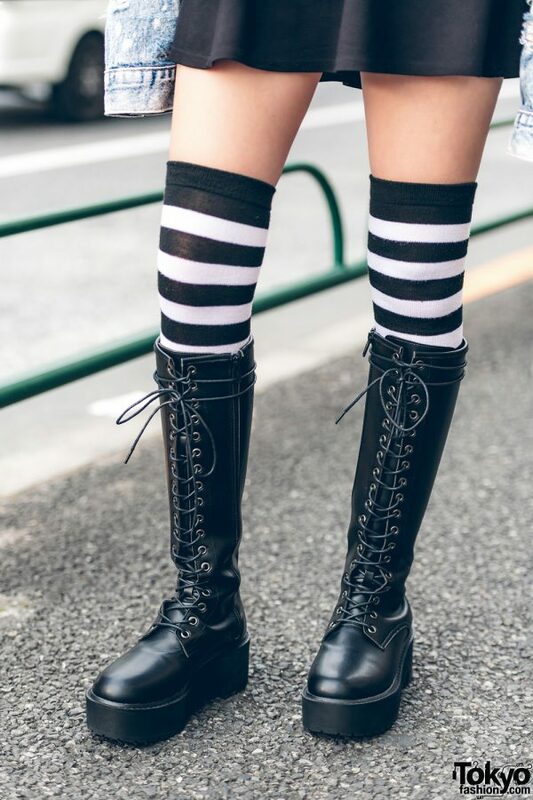 Lastly, 14-year-old Kaya is wearing an Adidas colorblock jacket, which she wore over a black WEGO shirt and leather zip up skirt, black thigh high socks, and Bubbles platform lace up boots. 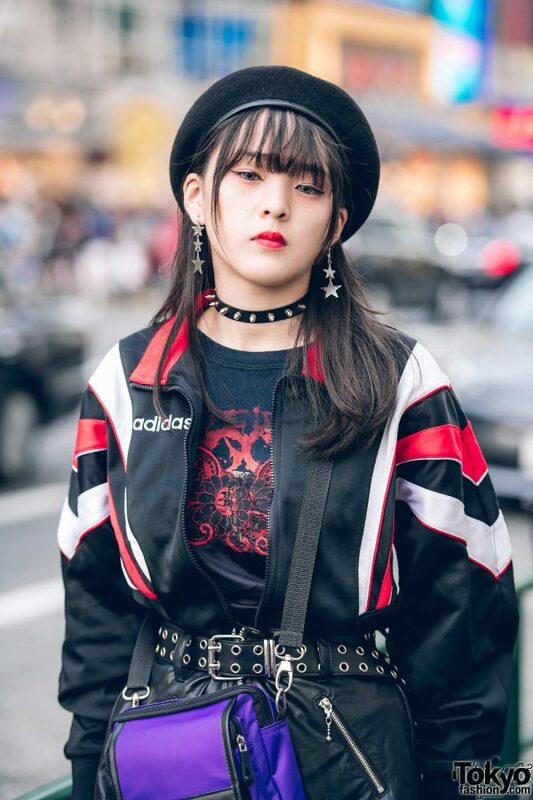 She accessorized with a black beret, a leather spike choker, star drop earrings, and a black grommet belt. 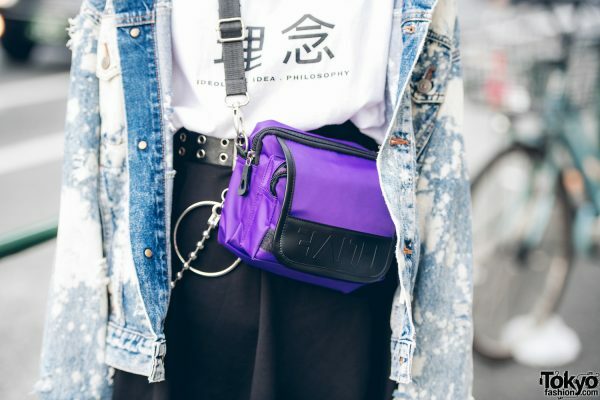 Faith Tokyo is Kaya’s favorite fashion brand. 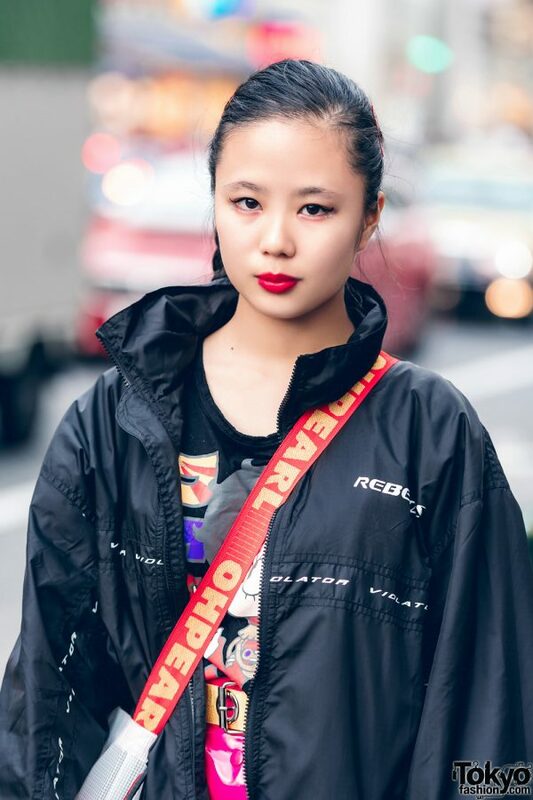 For more on Saya, follow her on Twitter and Instagram.